The Wednesday gang was all over the place today, and we were quite numerous too, despite the holidays. Could it have been the cake last week? Sorry, no more now, more next year, unless someone else is 65. A largeish gang assembled in the mess van at Toddington, but as we spread out over several sites today, it soon felt like a small one. We like the mess van where it is, in the parlour road at Toddington. It's handy for parking and loading up, and you feel in the middle of things. Locos trundle by as you drink your tea and talk about the day's plans. P&O was back in the unloading road, now facing the other way, and an unidentified green class 20 on the bit in the car park. Warming up for the diesel gala? Gang 1 repaired to Winchcombe, four strong, to sort out more sleepers. We are using every spare concrete sleeper that we have, and a visit will shortly be made to Gotherington to have another look at our rejects pile. There should be some in there that could be useable in the Broadway north siding. Gang 3 went to Broadway north, to work on the 8 lengths laid on Saturday, of which only 1 length was clipped up so far. 7 more to go then. Gang 2 disembarked at Childswickham, after the Landie shuttle had been to the site safe at Broadway north to get the tools. We got lots of friendly waves from the Broadway gang as we drove through between the platforms. 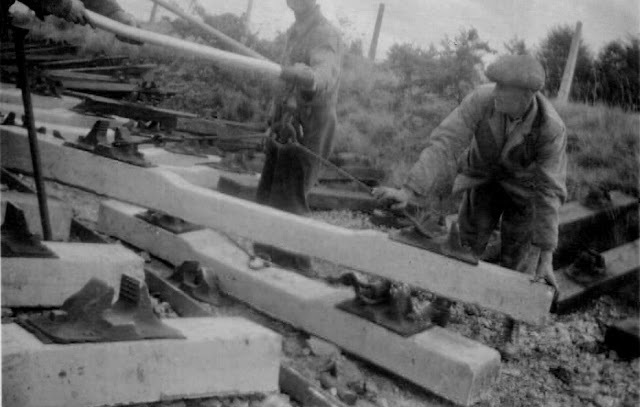 These concrete sleepers are so heavy that, even with a bar and a fulcrum, you have to use all the weight you have to get them up to meet the rail to clip up. At least it gave Rob a bit of extra height, so that he could point out where we are going to with the track. While clipping up the last two lengths at Childswickham - they were under the two bogie flats last week, so couldn't be done until the wagons were shunted into the distance - the Cotswolds team was actually ahead of the Malvern side one. Dave and Jonathan arrive at the end here, but we have to be truthful here and report that they started half way along. At noon we were all done here, so we collected up the tools as well as this PWay trolley, which we took to the north end, to be away from any temptation by third parties to put it on the rails and roll it towards Toddington. A peek over the edge shows that levelling in the car park has been completed. This area used to be 2ft deeper, and many years ago held allotments belonging to the railway staff members that lived in the 7 buildings at Broadway. It is said that they stopped growing vegetables here because passers by on the Private Road kept picking the stuff. We found numerous old bottles of water and beer here in the early days of Broadway, including a complete soda syphon. All liquids to keep the poor allotment holders refreshed during their gardening duties. The brands on the bottles were all local - Cheltenham Original Brewery, Brearley waters, Arden waters, even one from the Lamb brewery at Frome. On our journey onwards to Broadway north to join gang 3, we saw signs of clearance along the fence line, where the running line will be located. Behind is the original goods shed, which we sold to the Caravan Club to raise money for the Chicken Curve slip. It now looks well maintained, we must say, they are looking after it well. At Broadway north, gang 3 had made great strides forward, with the whole stretch behind them already clipped up, and only 2 more panels to do. Here's how far they got at lunch time - almost at the end, so that Saturday's gang can continue laying track. After a hasty lunch in the open - it wasn't very 'al fresco', and was hot, sweaty and humid today - the Landie was in further demand. First to pick up all the bearers discarded at Broadway from the 212 sleepers laid, and then take them to Gotherington, for use there when we stack the sorted out rejects Monday week. Then back to Winchcombe, where we found gang 1 frustrated by a severe puncture on the Telehandler. An expensive new tire needed, was the diagnosis. Cash out, and no more work - a bad combination. Fortunately they had pretty much done at Winchcombe what they set out to do, but the planned trip to Gotherington was made impossible until the new tyre was mounted. We then responded to a call for more Pandrol clips for Broadway, and loaded the Landie up with a pile of sacks. On the way back along the B4632 we were stopped by this monster combine. It was so wide that it used up 1 1/2 carriageways, and its cutting blades at the front were so wide they had to be dismounted and pulled along lengthways by a special extra tractor. Our little corner of the Cotswolds resembled the grain basket of the Ukraine! ... an ice cream! Richly deserved, we felt. Mint and chocolate flavour - we recommend! We received a fascinating email from John Barcy, former P.W. Supervisor with the Paignton and Dartmouth Railway. He attached two historical photographs of a relay with concrete sleepers at Newent, which we would like to share with you. 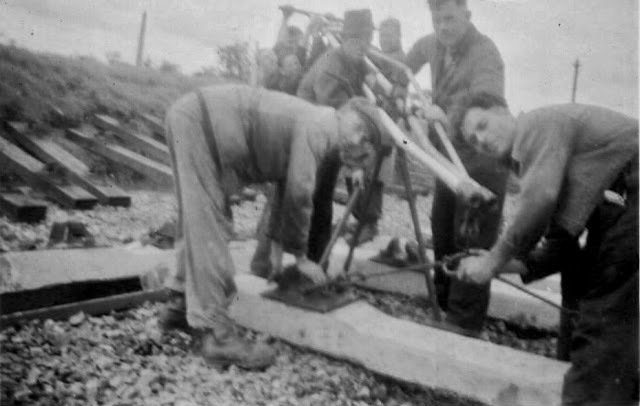 We can see new, white coloured concrete sleepers with bullhead chairs in the foreground, and the wooden sleepered track being replaced in the background. One (!) concrete sleeper is being lifted by means of two metal loops supended from a central frame. ... there isn't one! The heavy sleepers were laid using this amazing counter balanced contraption, which seems to be made of three tubes mounted on a tripod. At the rear there are 5 people hauling down on the other end, with the people in the middle steering the contraption round so that the sleeper comes to rest in its allotted place. You can soon work out that you have to move the contraption along for each sleeper laid. Slow, but it works. John also mentions concrete sleeper nips that were available - we have never heard of these. A concrete sleepers weighs about a quarter of a ton. If anyone else has any interesting old photographs that they would like to share, we would be happy to receive them via breva2011 (at) hotmail.co.uk. And thank you John, for these wonderful pictures. Please read the Facebook page as there may be some more rail and sleepers available. Also, the side of the goods shed and up to the fencing is the official lead dog walk for the site. We can't remember exactly but last time we were there last year, the greenery made the fence secure ish. Not sure who responsible but not wanting an accident. It's looking really good. Well done for working in the humid thundery weather. The goods shed looks bigger now that you are close up to it. Love the historical photographs. I bet they would have liked a JCB and a Telehandler in those days - without a yellow vest in site! Ah well..... Regards, Paul. Isn't it obvious? The goods shed would look bigger if you were close up to it! Toddington Ted. Another great blog Jo. Thanks for putting the Newent pics on. We used to estimate a CS1 chaired concrete sleeper at weighing in at 7cwt.You could get six men round one in reasonable 'comfort' to pick it up with nips, the problem came when moving over uneven ground and the load came onto four men or worse still the middle pair! There is a manual lifting device for picking up Pandrol fitted sleepers where you can use 12(!) Men to pick one up, but who wants do that, except for spot resleepering. Regarding the earlier question of how to lay double track when you don't have a road-rail machine, I came across another possible solution while I was volunteering at the S&CR (Swindon and Cricklade. They have an old HiAB mounted on a four wheel flat truck which can be pushed around by a loco - or perhaps a road-rail Land Rover? (I have a picture somewhere of a larger RR vehicle pulling a small train or ballast trucks! If you couldn't get your own HiAB unit maybe putting the JCB on a well wagon might help?